Water leaks can cause extensive damage to your property and furniture if not addressed right away. The materials used during construction of your home could end up absorbing moisture resulting in long-term and costly damages. Moreover, not attending to leaks predisposes your family to health issues that arise due to development of mold and mildew which thrives on the moisture. If your home or business has experienced water damage from a pipe leak, plumbing leak, or a hidden leak behind a wall, contact Disaster Doctors in Salt Lake City, Utah. We provide water damage restoration services throughout Utah. Give us a call at 801-210-1988 as quickly as possible so that we can reduce the amount of damage to your home or business today. Why Should You Engage a Professional in the Pipe Leak Water Damage Restoration Process? At Disaster Doctors, we have been offering water damage repair services for the last 10 years during which time we have gained experience in handling even the toughest water damage issues. We know that time is of essence and we are available round the clock to help you preserve your property and avoid mold growth. We assess and evaluate the damage caused and will let you know what needs to be replaced. Wall panels or the ceiling might need to be removed and replaced depending on the extent of the damage. We have all that it takes to do this as fast as possible. Water damage repair often requires using specialized equipment and products. These will help in removing moisture not only from the floor but also hidden moisture from upholstery efficiently and swiftly. Dehumidifiers are then used in the drying process, and finally, the affected room is cleaned and sanitized. As industry leaders, we emphasize on continuous training to each member of our staff, not to mention the hands-on experience they have gained over time. They will help find the source of the leak and perform the necessary water pipe leak repair at your Utah home or business. What Should You Do BEFORE Water Leak Repair Professionals Arrive? As soon as you suspect a broken pipe, turn off the water at the stop tap. This is usually located near the water meter or where the main pipe connects with your house. Drain the pipes by turning on all the faucets and flushing the toilet. Shut the water heater off and again, turn on each faucet to drain the hot water supply. Once the pipe completely drains, the leak should stop. A room that is more humid than usual could be a sign of a hidden leak. Dark stains on the wall, ceiling or the floor could indicate a burst pipe. The presence of mold and mildew is also a tell-tale sign of a water leak, but the most obvious would be higher meter readings and an increase in your water bill. 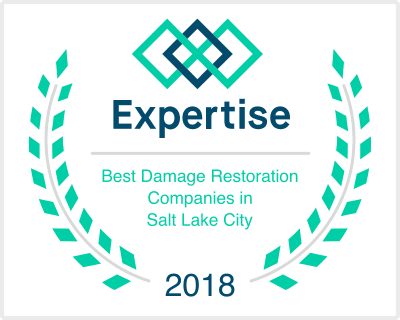 At Disaster Doctors, we are a locally owned and operated damage restoration company in Utah with technicians that are IICRC certified. We know our way around, and we guarantee that will be at your door in 60 minutes or less of calling us. Not only will we carry out the necessary pipe leak repair but we will also evaluate the extent of water damage and restore your home’s condition within no time. No need to worry about our charges as we bill your insurer directly. Experiencing any water leak damages anywhere in Utah? Contact Disaster Doctors immediately for water damage cleanup services at 801-210-1988.